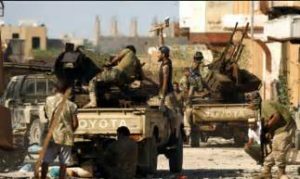 The Libyan National Army (LNA) opposed to the UN-backed Presidential Council has confirmed the death of three of its forces in a car bomb attack blamed on the Islamic State group (IS). The attack was carried out by a jeep fitted with a bomb, which targeted members of the 127th Infantry Brigade that was part of the Juffra Operations Room, Ahmed Mesmari, spokesperson for the eastern army said. Libya Herald, citing the army official, notes that the attack took place at a checkpoint manned by the army, 22 km west of the central Libyan city of Waddan on the road towards Tripoli. Two other army personnel were injured in the attack. The LNA led by self-style Khalifar Haftar controls large swaths of the Libyan territory in collaboration with the country’s internationally recognized House of Representatives, located in the eastern city of Tobruk, and the Beida-based administration. Haftar and his army have declared victory over jihadists in the eastern part of country and around Benghazi but the terror group still stages sporadic attacks against the LNA. Haftar, former Gaddafi’s key aid, is eager to become the country’s future president. He has endorsed UN-planned elections believed to take place late this year. The army commander has however warned that he would not accept rigged results and that he would ask a national mandate if things go chaotic. Written by: KanelkaTagba on February 22, 2018. Posted by KanelkaTagba on Feb 22 2018. Filed under Headlines, World News. You can follow any responses to this entry through the RSS 2.0. Both comments and pings are currently closed.